We have no excuses for a poor weekend in the winners’ department. Our overnight features did not produce and neither did our attempts to beat favorites at the Meadowlands’ highlighted affairs. In fact, the winner we offered in the William Gilmour Final turned into a massive favorite. The horses-to-watch (H2W) list results are below, not looking as impressive as they have over the past few weeks for a major reason. Last Thursday’s offerings were slim. Many of the horses expected to thrive did not race, leaving the list rather limp. A few tracks, like Buffalo, Miami Valley and Monticello, presented slim-to-none H2W members. Still, the list presents some successes. Don’t let this discourage you, we endorse the great across-the-board and exotic plays you can find through the H2W exclusively for your TwinSpires harness bankroll. One poor week did not stain our season, which has already produced many top-prices horses. Also last week, did not rise to the occasion of Buffalo Raceway’s TwinSpires bonus Pick 4. For the first time in over a month we went winless, offering only one third and two seconds in six suggested contenders. Remember that every Wednesday night TwinSpires’ 10-percent-bonus Buffalo Raceway 50-cent Pick 4 wagers continue. We assist with suggestions for your ticket via Twitter -- @FrankCotolo, @TwinSpires and @BuffaloRaceway and have delivered some major contributions to the winning combinations. The surprise favorite in the “Gilmour” final was National Debt. We underestimated the public’s eye on this unbeaten colt. He won and paid $2.80, $2.10, $2.10 (ok). In the Charles Singer Final we ran out of the money with Clementine Dream at 43-1. In our overnight features at the Meadows, our second choice, another overwhelming public choice, Connie Keeper, won ($2.20, $2.20 [ok], $2.10) while our first choice, RT USS Chilton finished seventh at 15-1. In the second chosen overnight Brown Titan finished sixth at 8-1 and second-choice Incredible Dragon was fourth at 17-1. Failed choices from our previous week’s overnight features appear for the second time in the H2W list. A 16-month contract with the Illinois Harness Horsemen’s Association allows Maywood and Balmoral parks to hold racing again. The opening of the 2014 racing season will take place on March 14 at Maywood. Balmoral’s opening weekend starts March 15. Post time at both tracks will be 7:10 p.m. (CDT). In a slight departure from its usual racing schedule, Balmoral will be dark on two Wednesdays, March 19 and March 26 before continuing with its usual Wednesday, Saturday, Sunday racing schedule. Maywood will race on Thursdays and Fridays as usual. The rugged Foiled Again made his 2014 bow for the Ron Burke barn in a qualifier at the Meadowlands and showed no ware for the worn as he defeated Bettor’s Edge in 1:53. Also returning with a sharp prep for Team Burke was Charisma Hanover in a 1:53.2 romp over 2013 Breeders Crown-winner Shelliscape. Summertime Lea is another four-year-old mare making her 2014 debut for Burke and she finished strongly to win in 1:52.3. And Burke’s Sweet Lou is back for a five-year-old campaign and qualified with a win in 1:52.1 mile with a 26.4 final panel under no Matt Kakaley urging. Buffalo Raceway has added Thursday, March 27 to its racing schedule. The race card gets underway at 5 p.m. Racing at Buffalo continues throughout March on Wednesday and Thursday with a 5 p.m. post and Saturda,y which starts at 6:40 p.m. Racing in April will take place Wednesdays at 5 p.m. and 6:40 on Fridays and Saturdays at 6:40 p.m. The winter rehabilitation for Hambletonian-winner Royalty For Life is reportedly older. The four-year-old trotter will work out of the Massachusetts stable of George Ducharme after recuperating from surgery. “He is supposed come April 1 when I'll be moving the stable to Vernon Downs,” said Ducharme. “Royalty” underwent surgery to remove a bone chip from a knee last fall. Surgeons said the operation went perfectly and the horse’s prospects to race again are great. Royalty was scratched from the Breeders Crown Final after finishing fourth in his elim on Oct. 12, which turned out to be his final start of the year. At Dover, reports track publicist Marv Bachrad, horses with long winning streaks dot the daily track race programs. Among them is Manhattan Rusty N, who currently, is king of the claimers, winning five straight. 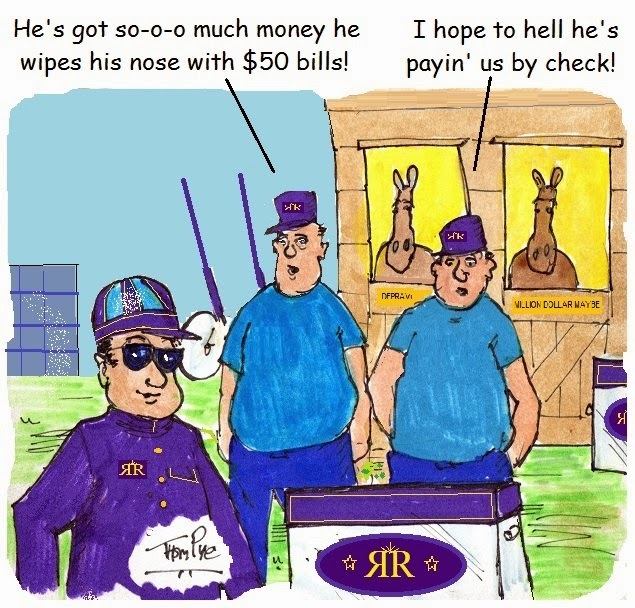 He was claimed for the third time in four races, this time for $30,000. Ideal American stretched his win streak to four, Fire In The Belly also is on a four-win skein and Spinfiniti has a three win-streak. The TwinSpires harness blog suggestion is to for these horses and wager against them with legitimate contenders because the streaking winners will be hugely over bet. A list of 77 sophomore pacing colts have been nominated to the 31st edition of the Pepsi North America Cup. Headlining this year's group of nominees is the Dan Patch Award winner and undefeated Hes Watching, who set two world records last season along with six track records for trainer and co-owner David Menary. Though the colt had a frosh mark of 1:50 and $291,722 in earnings, he didn’t defeat any top 2013 frosh-colt pacers as his top performance in stakes races were in New York Sires Stakes. Arthur Blue Chip, on the other hand, banked $400,120 last season (and we supported him here when he paid the most for his frosh winning efforts) for trainer Dr. Ian Moore. Luck Be Withyou, the 2013 Breeders Crown champion, is on the list. He won five of 11 tries last year for trainer Bill Cass and won $363,000. Last year's Metro Pace winner Boomboom Ballykeel (a TwinSpires harness blog selection paying $23) and the undefeated National Debt are also on the list.